This sliding pocket door system has been designed to use with 30 minute fire doors (FD30 ). It includes all the benefits of the standard Classic Pocket Door System plus a specially designed jamb/architrave kit made from a very particular hard wood called Pterygota bequaertii commonly known as Koto. Independently fire-tested and certified this Fire-Rated Single FD30 pocket frame is now compatible and certified for use with the BIAS Soft-Close Anti-Slam. 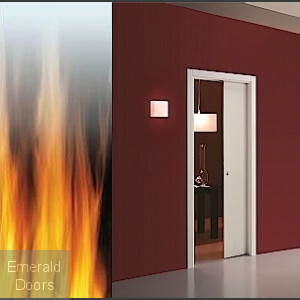 Browse our category of fire rated pocket door sets which are available with flush fire doors and also glazed fire doors.